By now you probably know at least who Arch Enemy are and have some idea of what they sound like. "Burning Bridges" is the third album from one of the best bands to ever come out of Sweden. Eight tracks of melodic and powerful riffage from Arch Enemy has suited me well. Musically, the band has improved. They have taken the highest elements of their music and amplified it to become something stronger and more powerful. The vocals have improved from what they once were, but not by much. John Liiva has become more confident in his vocals. Liiva’s problem isn’t really his confidence though. His problem is that he has very little range. He stays were he is comfortable, and doesn’t try anything out of the ordinary. At least that’s not the same with the guitars though! The music has become even more melodic than it once was. The harmony and excellence that the Amott brothers play together with is very impressive. The solos seem to be even more interesting than they once were and are simply stunning. The Amott brothers are one of the best guitar duo’s ever, and their ability to find an excellent riff or lead is unparalleled by their competition. Everything on this album seems to be more memorable and something that you will be banging your head to even when the music is off. Arch Enemy is consistent in their ventures into metal. Their hard work and determination to become one of the leading bands of the scene has paid off. They continue to separate themselves from being clones of the scene and instead of following the footsteps of In Flames or the like they destroy everything in front of them to forge a new path. Bottom Line: This album is necessary album for anyone into melodic metal, or anybody who is loves the style of the Gothenburg scene. One band that has managed to stick it out and already begin to leave their mark on the death metal world is Arch Enemy. This disc is an example of years of practice and hard work, and the reward is given in the form of many dedicated and loyal followers. 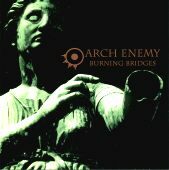 As most of you know, this is Arch Enemy's third release. Their previous effort, Stigmata, in more ways than one, was a bit of a departure for the band, both musically and vocally. With Burning Bridges; however, the band returns to what made Black Earth such a killer debut. The songs are nice, tight, and short not to mention catchy and brutally heavy. The guitars are perfect, the drumming is perfect, the bass is perfect, and even the vocals, which many shun as being the weak link for the band, are incredibly powerful. One of the highlights on the album is Angelclaw. When you hear this song, you know this is the song that could best be used as a finale at a live show to bring down the house! Bottom Line: I urge all of you true metal heads out there to pick this up straight away!